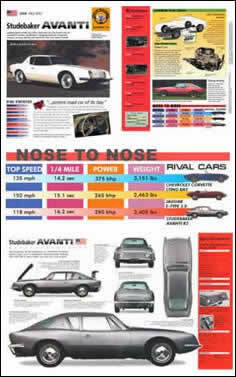 "Looking unlike any other American car, Avanti attempted to bolster Studebaker's flagging fortunes. The Raymond Loewy styling and sports-car feel won many friends." Avantis are powerful, and the top versions are among the most potent road cars of their day, with a gutsy V8 engine, suspension tuned for sports-car driving, a low roof line and a long hood. The ride is hard and the car doesn't roll much because of its anti-roll bars. Styling of the Avanti's very functional interior is surprisingly European. The Avanti has all the credentials of a hand-built European sports coupe, yet it's 100 percent American made. Supercharged V8 engine—Some versions of the Avanti's V8 engine have Paxton superchargers. One experimental version, the R5, has two superchargers and fuel injection, and is claimed to develop 575 bhp and an amazing 196 mph. Four-seat interior—Opening up the fiberglass doors reveals an interior that is spacious by the standards of contemporary sports coupes. Sturdy chassis—The twin-rail, box-section ladder chassis is a development of Studebaker's standard sedan car chassis, which dates back to 1953. Antiquated suspension—Although beefed up with anti-roll bars, the suspension belonged to a previous era. Fiberglass bodywork—To minimize time and tooling costs, Studebaker opted for fiberglass bodywork. The Molded Fiberglass Company had quality problems, however, so Studebaker decided to manufacture its own bodyshells. Front Disc Brakes—The Avanti was the first American road car to have standard front disc brakes. They are a Dunlop design with servo assistance. Loewy styling—The fantastic and unusual styling of the Avanti was the responsibility of famous designer Raymond Loewy. The power pack—Although the engines used in the Avanti are versions of the 1950s Studebaker 289-cubic inch V8, they have been substantially modified. There are five versions in all. Firstly, there is the basic 240-bhp R1 and the 290-bhp R2 fitted with a Paxton supercharger. The 335-bhp R3 has a supercharger and a higher compression ratio, the 280-bhp R4 is a twin-carb, four-barrel version and the experimental R5 has twin blowers and fuel injection to produce 575 bhp. The post-Studebaker Avanti IIs use Chevrolet engines. Old-fashioned chassis—Studebaker used the twin-rail steel chassis from the Lark. For its new task, Studebaker engineers beefed up the chassis with front and rear anti-roll bars and rear radius arms. Studebaker Avanti Hot Cars, Dream Machines, Group 2, Number 13. Cover, back cover, blow up of back cover graph, and the inside spread.